Cut the rope is now available as a free gaming application for Windows 8 in which you need to feed the hungry cartoon character named as “Om Nom”. This game is all about cutting the ropes in a well planned manner to feed Om Nom with the Candy and getting the stars to reach the next level. Feeding Om Nom is not that easy because Om Nom cannot move from his place to catch the candy. So you have to cut the rope very carefully in a well planned manner so that it touches all the stars and finally falls into the mouth of hungry Om Nom. However, Om Nom’s sitting position may be different in different levels. 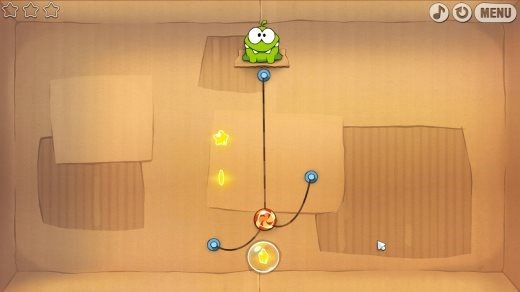 Cut the rope for Windows 8 comes with three different stages i.e Cardboard Box, Fabric Box, and Toy Box.There are 9 levels in Cardboard Box and Fabric Box and 7 levels in Toy Box. When you launch this game, only the Cardboard Box stage is opened to you, other stages are locked. So to unlock these stages, you need to get prescribed number of stars.. You need to get atleast 20 stars in Cardboard Box to unlock and play Fabric Box, and 40 Stars in Fabric Box to unlock and play Toy Box. So you should never miss a chance to get maximum stars in each level while passing from one level to another. Don’t forget to check out our post on Flipsaw puzzle for Windows 8. This free gaming application includes various objects like air balloons, bubbles, and spikes along with the stars which makes your game interesting and little bit complicated. Air Balloons present in the Fabric Box and Toy Box are helpful in collecting stars, as they throw air on the candy to make it move. Stay away from bubbles, as they may take the candy away. One of the funniest thing about hungry Om Nom is that it make funny faces and do few funny actions. Cut the rope includes a game menu in which various options are available such as continue, skip level, level select, and main menu. With continue option, you can continue the game where you left it earlier. With skip level option, you can avoid or skip any level which you find difficult or which you don’t want to play anymore. With level select option, you can jump from one level to any other level without completing the earlier levels. With main menu option, you will come across the main screen of the game in which you need to select a stage to play. 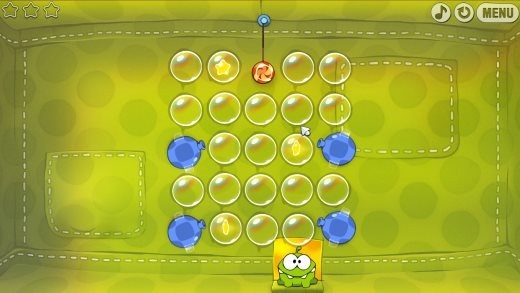 Cut the rope game for Windows 8 is a fun filled gaming application that offers three different stages to play. Try this free gaming application from Windows 8 App Store and have fun while playing.